A newcomer to the top Belarusian football league, FC Krumkachy (or Ravens), from Minsk became the most discussed phenomenon of Belarusian sport in the media in 2016. The story of the club plays out like a Hollywood movie. A group of enthusiasts founded the club just five years ago, and after three years in minor leagues their dreams came true. Krumkachy earned the right to debut in the country's major professional league. The way most football clubs in Belarus are run bears many similarities to state-owned enterprises. They are unprofitable, state subsidised, unable to attract spectators, and struggle to compete with European teams at international tournaments. In this context, Krumkachy's bright start symbolises the encouraging developments in Belarusian sport. Belarusian club football is very different than in Europe. Despite the economic downturn, the Belarusian football federation has been enlarging its top league, while many European top leagues are reducing the number of teams. In contrast to most leagues in Europe, the tournament in Belarus starts in spring and finishes in autumn. Moreover, match attendance has been on the decline for years, and is very much contingent on the results of specific clubs. This make Belarusian fans among the least 'patriotic' in Europe. Why so? The structure of Belarusian football clubs differs little from professional football during Soviet times. Most often, founders of clubs represent local authorities. A state-owned company situated in the same region as the club often becomes its only sponsor. A plant which makes electrical tractor equipment owns FC BATE Barysau, SC Belaruskali, which produces potash fertilisers, maintains FC Shakhtsior Salihorsk, etc. In most cases, managers of clubs are recruited from state industry or thanks to their connections with the authorities. Thus, it comes as no surprise that they rarely bring in much money, instead relying on subsidies to keep up the team. They refuse to work with spectators or the media and do nothing to bring in funds from outside. Even the web-pages of many clubs are amateurish and rarely updated. Most stadiums are very uncomfortable. There are not enough food vendors and beer is not sold. BATE, the leading Belarusian football club, is perhaps the only exception to this rule. However, the most striking feature of the largest Belarusian football league is its boringness: games are completely devoid of intrigue. The league's leader, BATE, has won the league championship for 11 years in a row now. The most telling measure of the flagging interest in the Belarus league is probably attendance statistics. There has been a steady decrease in attendance for years, hitting an all-time low in 2016. The average match attendance in the 2016 season was just 1480. For comparison, in 2007 average attendance reached 2512. The economic crisis has only made matters worse. Already struggling Belarusian clubs became even poorer. The lack of money caused many Belarusian football players to continue their careers in less prestigious leagues in Kazakhstan, Latvia, or Lithuania. The annual budget of BATE in 2016 amounted to $6m. Its closest rival, Dynama Minsk, has an annual budget of only $3m. In contrast, the budget of Zenit St-Petersburg in the 2015/2016 season was $185m; Shakhtar Donetk had a budget of $85m. In 2016, going to Krumkachy matches in Minsk became trendy: only BATE and FC Viciebsk matches attracted more spectators this summer. Club management succeeded in drawing in young people who had not been interested in football before. Traditional ultras nick-named FC Krumkachy 'the hipster club' and started goading new fans with chants such as 'some things are fashionable, some things are forever'. Many fans were won over by the remarkable history of the team. The co-founders of the club got to know each other in 2011 on the online forum of the popular sport newspaper Pressball. They decided to establish a football club, and four years later the club advanced to the top league of the Belarusian championship. The club succeeded despite very limited resources. The team's coach, Aleh Dulub, had been out of a job for about a year. However, he achieved remarkable results with half-amateur players which other clubs had rejected. Despite having only a $500,000 budget, the smallest in the league, they managed to finish in eleventh place. To maintain public attention, they ran a very aggressive campaign in the media and unlike most Belarusian clubs, they were able to engage sponsors and partners including the largest enterprise in the Belarusian brewing industry, Krynitsa, and one of the country's most popular commercial internet portals, Kufar.by. Its club owes much of its success to its General Director and shareholder, Dzianis Shunto. In the beginning of 2016, he owned 85% of shares. Born in 1982, he does not fit the typical profile for Belarusian football managers. Shunto played for Krumkachy several years ago when the club was established; it has never been linked with state agencies or state business. Although he has given a large amount of interviews to the media, it remains unclear what he did before Krumkachy. Usually, he says he was in business and travelled widely. They did not understand where we would get the money from. How we were planning to get through licencing. They clearly see other teams in the league, but they are anxious about us because they cannot calculate or control our team. They do not trust us. In our country it is not normal to trust people and understand their motives. Against all odds, Shunto proved that with limited financial resources and with no support from the state it is possible to establish a successful sport club. Krumkachy managed to bring in fans to the dismal Belarusian league. They were able to convince IT specialists and hipsters from Minsk night clubs to come to the stands. In 2016, Krumkachy was much more discussed in the media than any other club. However, it remains questionable whether such a startup can continue to be profitable. There are no profitable sport clubs in Belarus except BATE Barysau. For this reason, nobody knows how long Krumkachy can survive for. Partysan Minsk, another promising underdog, was forced to disband after fans failed to sponsor the team. The club will not be able to keep going if Dzianis Shunto loses interest in the project. Nevertheless, Krumkachy has already entered the history of Belarussian football. Only the future will show if the team will become the Belarusian FC Leicester or if they will repeat the story of many promising football projects which have since been forgotten. Belarus’s diplomatic activities slowed down before the holidays in December. The country’s diplomacy focused mostly on a multilateral agenda in preparation for its chairmanship of the Central European Initiative, as well as manoeuvring at the United Nations. 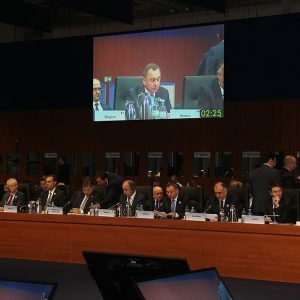 Foreign minister Vladimir Makei’s statement at an OSCE meeting was perhaps meant to be a programme declaration, but in reality it amounted to little more than bragging about Belarus’s arguable achievements and ambitious plans. Belarus has strengthened its diplomatic presence in Europe but has failed to avert the deterioration of its political relations with Ukraine. On 8 December, Vladimir Makei spoke at the OSCE Ministerial Council in Hamburg. His statement took the form of a set of suggestions aimed at preventing further degradation of Europe’s security architecture. Belarusian President Alexander Lukashenka’s recent idea of a new peace-making project modelled after the Helsinki process of the 1970s was the centrepiece of Makei’s statement. In November, Lukashenka invited the leaders of Russia, the United States, the European Union, and China to come to Minsk to negotiate a new world order. Realistically, Belarus’s foreign ministry seeks to convene a meeting of experts in Minsk to discuss the new geopolitical situation. The idea of a global summit in Minsk may be nothing more than a clever sales pitch for this expert gathering. Most of Makei’s other suggestions were merely a clumsy attempt to publicise the country’s recent foreign policy achievements among his European colleagues. Speaking on the need to promote connectivity in Europe, Makei mentioned Belarus’s imminent chairmanship of the Central European Initiative in 2017. However, few people would argue that the Initiative has played any significant role in regional cooperation so far. Belarus’s foreign minister also extolled inter-parliamentary contacts as a 'breeding ground' for important constructive decisions, helping to bridge differences among nations. In this context, he alluded to Belarus hosting the summer session of next year’s OSCE Parliamentary Assembly. Nevertheless, the role of MPs in today’s diplomacy is probably exaggerated. The authorities will use the gathering to help its appointed parliament acquire international legitimacy. Makei did not fail to remind the international community about Belarus’s role in negotiating a peaceful solution to the Ukraine crisis. However, European diplomats are well aware that Belarus’s contribution remains limited to providing a convenient venue for working-level negotiations. The foreign minister hailed his German counterpart's initiative to re-launch conventional arms control. In this context, he managed to mention Belarus’s chairmanship of the Collective Security Treaty Organisation as well as the country’s decision to renounce nuclear weapons twenty years ago. However, Vladimir Makei failed to mention that his boss, Alexander Lukashenka, had once called this decision an 'egregious blunder'. Despite Lukashenka’s direct order to prioritise trade relations with 'Distant Arc' countries, Belarus failed to open a single diplomatic mission in the developing world in 2015 – 2016. Instead, in November – December, Belarus opened three new embassies in European countries. Few people expect a large enough surge of Belarusian exports to Georgia, Spain, or Sweden to make a difference for the country’s foreign trade balance. Minsk may have been guided mostly by political considerations. The expansion of Belarus's diplomatic presence in Europe, together with the recent opening of the Austrian embassy and the appointment of the Dutch chargé d’affaires in Minsk, falls well in line with Belarus’s policy of unfreezing relations with Europe. Belarus finally re-opened its embassy in Stockholm, which had closed down after a diplomatic conflict in 2012. Minsk needs a more intensive dialogue with the Nordic countries, as this part of Europe remains the least supportive of normalisation of Belarusian – European relations on 'easy terms'. However, a full restoration of relations can happen only with the appointment of a new Belarusian ambassador to Stockholm. On 16 December, deputy foreign minister Yevgeny Shestakov inaugurated the Belarusian embassy in Madrid. Belarus’s diplomatic presence in Europe’s fifth-largest economy, which also boasts strong ties in Latin America, is long overdue. Vladimir Makei traveled to Tbilisi on 20 December to open Belarus’s embassy there. Recently, Belarus has been emphasising the development of political and economic relations with Eastern Partnership members, hoping for greater independence from Russia. Full-fledged diplomatic ties between Belarus and Georgia will help the two countries to better coordinate their policies towards both Moscow and Brussels. December marked the 25th anniversary of Belarusian and Ukrainian diplomatic relations. However, recent difficulties have cast a shadow on the celebrations. The bilateral turnover grew by 10% in January – October 2016 compared to the same period in 2015, with Ukraine firmly establishing itself as Belarus’s second largest trading partner. Last autumn, Minsk and Kyiv managed to put an end to a tariff war between the two countries. However, despite Belarus’s tacit refusal to support its closest ally, Russia, in the latter’s hybrid war against Ukraine, political relations between Minsk and Kyiv have lagged behind their economic ties. The two countries’ leaders have not met in a bilateral format since Petro Poroshenko’s inauguration. Lately, Ihar Sokal, the newly appointed Belarusian ambassador to Kyiv, has repeatedly emphasised the fact that over eighty per cent of Ukrainians have a positive attitude towards Belarus. However, many among Ukraine’s elite look very badly on Belarus’s recent vote against the UN resolution on human rights in occupied Crimea. This disappointment over Belarus’s unwillingness to openly condemn Russia has cooled diplomatic ties. Senior officials of the two countries’ foreign ministries have boycotted receptions given by the respective embassies to celebrate the 25th anniversary of diplomatic relations. Minsk may also have reacted in this way because of Kyiv’s delay in appointing a new ambassador to Belarus. On 10 November, Alexander Lukashenka and Petro Poroshenko agreed over the phone to meet in person before the end of 2016. The meeting failed to take place. Lukashenka’s encounter with former Ukrainian leader Leonid Kuchma in Minsk on 22 December may have represented an attempt to diffuse tension. However, doubts remain as to the feasibility of a meeting between Lukashenka and Poroshenko in the near future. The developments of the end of 2016 prove that Belarus is still more at ease working on relations with its European partners than most 'Distant Arc' countries. However, the steady stream of positive events in relations with Europe has so far failed to bring about full acceptance of Alexander Lukashenka as an equal partner by his European counterparts.